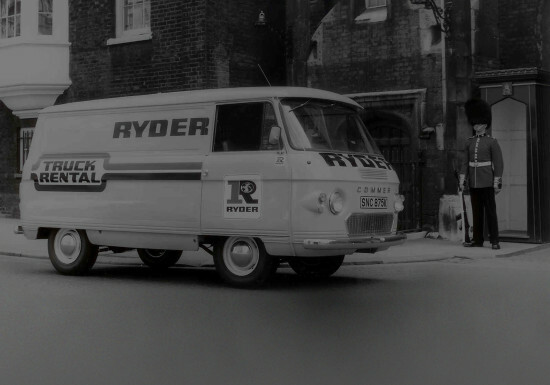 Established in the UK in 1971, Ryder has since earned a reputation for delivering solutions that ease complexity and increase efficiency for companies of all sizes. Ryder Truck Rental is established in the UK with a total of 250 trucks. Acquires Fisher Renwick Ltd, gaining presence in Contract Hire industry. Acquires Venture Transport, a London haulage company. Opens Ryder BV in Holland. Ryder GmbH is established in Germany. Ryder is awarded contract to supply 2,500 vehicles to 11 Army garrisons and Royal Air Force stations in Germany, Belgium and Netherlands. Derbyshire Fire Authority select Ryder to repair and maintain a fleet of more than 135 front line firefighting and support vehicles. Ryder announces £8 million investment in new technology platforms. Three- year Trainee Technician Apprenticeship is launched. Awarded 300 vehicle Fleet Management contract with Gloucestershire County Council. FleetCare Online is launched and a major fleet deal won with Solstor. Ryder wins contract hire deal with Premier Foods. Ryder continues an ongoing investment programme, securing the latest vehicles from premium marques with a £22 million rental order. Ryder supplies the first ever contract hire electric vehicle to Bunzl and Retail Maintenance is launched across UK locations. In our 40th anniversary year, we purchase Hill Hire Plc for £154 million. We also invest a further £22 million to upgrade and expand our rental fleet. We acquire the Euroway group, and invest £24.6million expanding our Rental fleet. We also extend our exclusive deal with Bridgestone, the world's largest tyre and rubber manufacturer. To enhance the used vehicle sales experience for our customers, we launch our used approved website. We also invest £25m in derogated Euro 5 trucks to provide customer choice in preparation for Euro 6. We strengthen our trailer business with the purchase of Bullwell Trailer Solutions. We also launch our Euro 6 demonstrator fleet to help our customers make informed decisions. We conduct the first ever independent Euro 6 fuel trial, and make further investments in our fleet to include 400 tractor units and 350 trailers. Recognised as Large Employer of the Year at the 2017 Asian Apprenticeship Awards for the positive impact Ryder has on its apprentices.